Survivor and author Carly Freels sheds light on battling cancer as a teen, provides insight to those walking alongside patient in new book. Although my plans of playing college volleyball and having a carefree senior year of high school came to a screeching halt, I knew God had bigger plans. 1 in 285 children in the U.S. will be diagnosed with some form of cancer before the age of 20*. Carly Freels knows how it feels to be a part of this statistic. Freels, a survivor of Hodgkin’s lymphoma, was just seventeen years old when her world came crashing down. 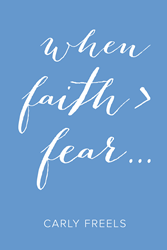 In her new book, “When Faith > Fear…” Freels offers hope to young readers who are battling cancer, provides insight to readers who are walking alongside a friend or family member with the disease and helps restore the faith of all who are affected through her firsthand account of her battle. For more information, visit whenfaithfear.wordpress.com. Carly Freels was a typical high school junior-she was a friend to many, she was an accomplished athlete, and she was looking forward to her senior year. All this came to an abrupt stop when she was diagnosed with cancer. Her world changed overnight, but her faith never wavered. Freels tells her story by reflecting on the events of each day that followed and the strength that was provided by God.